For high-risk applications, such as exposed bridge crossings, bridge risers and creek crossings, no other material provides more protection from damage than OMNI’s steel Opti-Com® conduit. 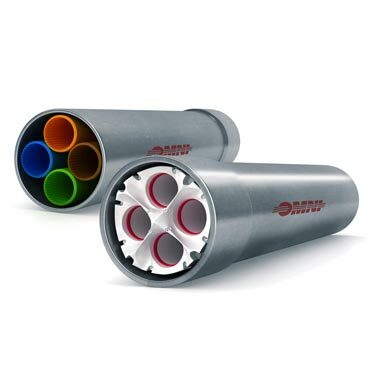 The steel Opti­ Com® can also be used in underground applications. The steel Opti-Com® system is manufactured using 4-inch rigid galvanized steel and is available with either three or four factory installed inner ducts. Each section is threaded and coupled for easy joining. Inner duct alignment is simple and secure, due to the same gasketed coupling system used in other Opti-Com® systems. No transition boxes or handholes are required when transitioning from steel to PVC or fiberglass Opti-Com®. Instead an adapter is all that’s needed, significantly reducing installation labor. Available with a full line of factory bends, expansion joints and conduit support to accommodate virtually any installation requirement. Steel Opti-Com® comes in 10-foot layable lengths with threaded and coupled ends. Each 10-foot length is also provided with a gasketed Opti-Com® coupling for the inner ducts.